Correct Taijiquan lies in the ability to differentiate between Yin (Empty/Light/ Soft) and Yang (Full or Solid/ Heavy/ Hard) within the body, and to maintain the constant interchange between them throughout the form. Taijiquan is the art of hard and soft, and the correct energy is like that of a spring. A spring’s pliability is soft, but not flimsy or weak, while its flexible tension is hard and strong, but not stiff. Regarding Taiji, hard without soft lacks cohesion, while soft without hard is empty, devoid of energy and strength. Many Taiji practitioners today only understand and develop softness, relaxation, and yielding, so when Taijiquan is no longer the art of hard and soft, there is no balance and flow, and the energy stagnates. Then, is the Quan (Fist or martial art skill) even really Taiji any longer? The Taiji Tu (Yin/ Yang symbol) is a two-dimensional representation of duality, relativity, and change. Everyone understands it as balance and harmony, but it is actually meant to be in constant motion, spinning and spiraling. This is the essence of Taijiquan. The entire body, as it moves through space, should assume the shape and energy of a 3-dimensional sphere, able to turn left and right, up and down, and a combination of the two, with the Dantian (the center of the sphere) as the source of all force and movement. Everything should appear rounded and smooth, with no sharp angles and straight lines (except for the back and spine which should be “as straight as a flagpole”). Circles are created by the movement, and, generally, movement follows the path of the circle. Master Chen Xin (16th generation Chen family) stated, “Taijiquan is a spiral force. If you don’t know spiral force, you don’t know Taijiquan”! An estimated 250 million people in the world practice Taijiquan. Aside from learning the external postures, a surprisingly large number actually have no concept of spiral energy! How many teachers of Taijiquan today know, understand, and apply spiral energy in their movement? How many teachers would be left perplexed and vexed if their students were to ask them to explain and demonstrate spiral energy? The problem with Taijiquan, and other complete traditional Chinese cultural skills, is that once they are simplified, modernized, and standardized, they become diluted. Then, they are not only incomplete, but also lose their intrinsic energy – that very quality that defined and distinguished them from the outset. The spiral is a phenomenon commonly found within Nature, from the sunflower to weather patterns (hurricanes and tornadoes), to nautilus and snail shells, to pine cones and pineapples, to the fingerprints, cochlea of the inner ear, and hair patterns of human beings to the double helix of our coded DNA, to the Milky Way galaxy. Tajji’s spiral or coiling energy is called “Chan Si Jin” (Silk-Reeling Energy). The function of Chan Si Jin primarily is to unify the body in motion, so that every part is connected, “like a string of pearls”. The movement gets it name from the silk worm, as it manufactures its thread. Physically, it is like wringing out a wet towel, except the body is the towel, wringing itself out, from inside out. Qi spirals from the waist and Dantian up the back to the shoulders, through to the elbows, wrists and fingertips, and then back along the same spiral path to the Dantian. At the same time Qi moves downwards through the hips, and knees, to the feet, before returning back to the Dantian. A common mistake among practitioners, trying to capture the energy of Chen Taijiquan, is to exaggerate the spiral movements, making the circles far too large and looping that the shoulders, elbows and wrists no longer connect with the Dantian. Those lacking in knowledge and discernment are easily impressed by this kind of movement, but, in truth, as the level of Taijiquan progresses, the circles become increasingly smaller, not bigger! Correct Taijiquan means for every movement, and step, the movement principles must be understood and followed precisely. Take, for example, the movement Circle Hands (also known as Cloud Hands or Wave Hands Like Clouds): There must exist a perfect balance in motion between both hands (one spiraling inward and down as the other spirals outward and upward), between the circling hands and stepping feet, and hands and feet must coordinate with the turning of the waist. Each step can be broken down into four parts, with two corresponding movement principles. Parts 1 and 3 follow the first movement principle, and parts 2 and 4 follow the second movement principle. First Movement Principle is “Change Weight and Change Palms” (together). Second Movement Principle is “Turn Waist and Step” (together). This sounds simple enough, in theory, but achieving this in practice, evidently, for many students and practitioners, is far from easy! The common error is hands leading the waist, and waist turning without stepping, which means the internal connection between upper body and lower body is severed. This means the stepping comes too late, and, consequently, forces the changing of the palms together with the stepping, and not with the weight change, as is meant to be. So, with the movement principles confused, and the natural (correct) order or sequence wrong, the internal energy is disharmonious, immaterial of how relaxed and flowing the individual may be in his own mind. If the movement principle and energy is wrong, the application is, thus, rendered ineffective, and the form loses all meaning and functionality. Circle Hands is just one form within the entire routine. If the practitioner’s understanding and execution of this movement is misunderstood and misapplied, is it then likely or unlikely that the energy of the rest of the forms in the routine will be correct? Of all Taijiquan’s Eight Energies (Ba Jin) – Peng (Expanding/ Warding Off), Lu (Yielding/ Absorbing), Ji (Squeezing/ Crowding), An (Pressing/ Pushing), Tsai (Plucking), Lieh (Splitting), Zhou (Elbow), and Kao (Shoulder striking/ Bumping) – Peng Jin is the most important. It is the very essence of Taijiquan! It must exist and work in conjunction with all the other energies. Without Peng nothing else works in Taiji. Peng Jin is an outward supportive strength, yet it is neutral – neither aggressive nor passive. It is best described like a fully inflated or solid rubber ball. It should be firm and resilient, yet somewhat flexible and lively, and springy, not stiff and rigid, requiring effort and using strength. Peng is necessary to the structured roundness associated with Taiji energy, and roundness is essential to Peng Jin. Unfortunately, a great misunderstanding exists with Taijiquan. Many misinterpret relaxation, and take “softness” too literally. They think that the goal is to relax more and more, but too much is erroneous. This is why the common image of a Taiji practitioner’s physical structure resembles an overcooked noodle – slack and limp, almost like an invertebrate. “Relaxed” then becomes “collapsed”, when Peng is lost. This situation is called “Diu” (losing or abandoning). Relaxed, or rather, most comfortable and natural, while maintaining Peng, is the correct energy. Actually, the real, true and deep physical relaxation comes from “grinding out the tension” until there is none left. In this process the body (bones, muscles, tendons and joints) must be worked hard in order to become very strong, leaving a solid, tensile inner structure, like the steel support beams of a tall building. When Taijiquan looks weak and flimsy, and devoid of “Spirit”, it is, because Peng Jin is absent, and even the relaxation is only superficial – in the imagination and not on the cellular level. Peng cannot be willed into existence, nor arrived at by happenstance. It is the result of external posture training, and internal Jin training, over time. Peng is produced when the mind, Dantian, and posture are relaxed. Qi must flow with no stagnation. Only with Peng Jin present is it possible for the waist to turn and the upper body to rotate with it, and neutralize incoming force, to achieve “One ounce deflects a thousand pounds”. Without Peng, connectivity is lost, so while the waist itself may turn, the arms will not turn with it. And, if the arms collapse against incoming force, the force cannot be redirected. Instead, it will continue to bore into the defender’s centre. Without the need to turn and redirect, when Peng energy is correct, the incoming force goes through the entire body, down to the legs and into the ground, reinforcing the strength of the stance, and rebounds back through the arms. To those pushing against it, the strength will feel like a solid wall, or a big, sturdy tree. This is Taiji’s renowned “rooting energy”. Peng Jin has to be maintained within the legs and crotch too. The legs should be able to withstand force from all directions. Peng Jin is lost in the legs, when the hips are closed, due to the rear knee straightened out and hip extended (so they become locked and Qi does not sink) or the rear foot is turned inwards too far, causing the knee to fold in, which is certain to collapse under any force. Taijiquan classics state, “Be as Still as a Mountain. Move like a great river”. A mountain is firm, strong, silent, solid, immovable, and enduring. Stillness originates from a calm and patient Mind, which must be disciplined through stillness training – a standing meditation called Zhan Zhuang (Standing Pole). This preparation form, to stand like a mountain, develops vital energy, Bone Qi and leg strength, and a still mind, as well as awareness and sensitivity to the internal body. Training reinforces the Mind-Dantian connection, and the communication between the Dantian and the entire body. Zhan Zhuang can be practiced anywhere from ten minutes (minimum) to two hours (maximum). Those that neglect this important aspect of training altogether will never understand Taijiquan deeply, but also tend to be restless, and rush and blunder through the form, without care and awareness, and will miss the internal feeling of deep stillness. Is it just co-incidence that the highest-level practitioners all train Zhan Zhuang, and the very worst do not? Moving like a “great” river means to flow ceaselessly between the forms, without pause, and with effortless power. Some practitioners complete a movement only to come to a full stop before beginning the next. Externally, this resembles a slowed-down version of Karate more than it does Taijiquan. Internally, Jin cannot change freely, so the rolling sphere energy, essential to the skill, is lost. Every movement in Taijiquan is either opening (expanding) or closing (contracting), but the changes outwardly are almost imperceptible. Externally, as the movement expands fully, the internal body has already begun to contract, and the external body follows. Similarly, as the outer movement has fully contracted, the internal body has already begun to expand. Imagine drawing a circle: you begin as the pen or brush touches the paper, and stop when the circle is complete. With the most perfect circle you cannot see the blot of ink where it begins, or the join at the end. The energy of Taijiquan should be just like this. The nature of water is to be soft and gentle, as it makes its way through cracks, and adopts the shape of the vessel it inhabits. On the other hand, water can also be extremely hard, and crash with tremendous violent force, and overcome nature’s hardest elements, eroding rock and corroding metal. Water can be both a nurturing, life-giving force as well as a force of absolute and terrifying destruction. Yielding, or neutralizing force, is to change to become soft; to empty and disappear like a ghost, be as a shadow, offering no resistance. In attack, when every part of the body is connected, unified and focused, the energy changes to hard and fast, and to those on the receiving end of this force, unable to withstand it, it can really feel like a tidal wave! 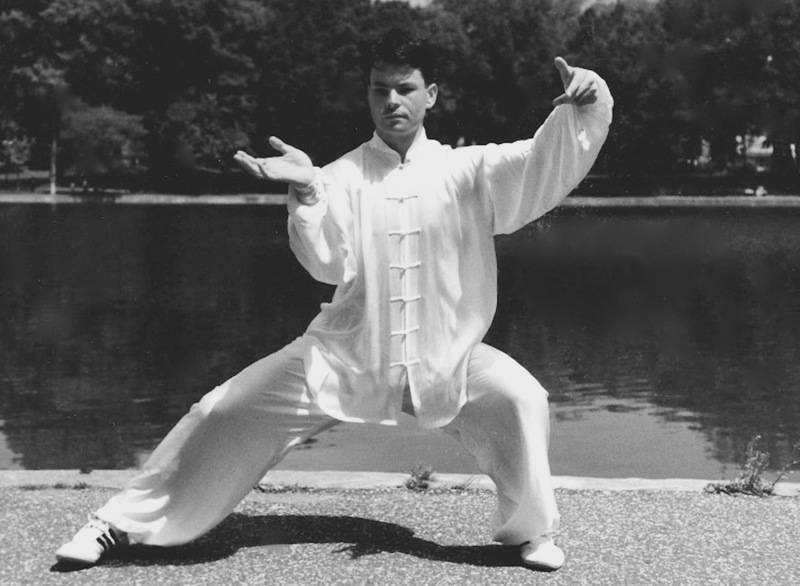 Just as water sinks to its lowest level, in Taijiquan it is the Qi that must sink, training the legs, and producing a solid, and stable supporting base, which is the very foundation for the all body’s strength and power, and allows the upper body to completely relax and empty itself of all tension. It is through this heaviness that lightness and agility arise. Moving like a great river is not possible without involvement of the waist and Dantian. The Dantian is the axle and the limbs are the wheel. Failing to employ the waist is a very widespread defect. Taiji principles state, ”If one part of the body moves, all parts move. If one part is still, no other parts should move”. If the hand moves by itself, then the energy, clearly, is not correct. The Dantian makes the connection through the muscles and bones to push the hands. At the same time, it is driving the hips, legs, knees, and feet. The whole body is all coordinated together through the Dantian. As the center of all energy in the body, it pushes the force to the rest of the body, which moves along with it. Being the body’s center, the Dantian must remain stable and level, to maintain equilibrium when stepping and to keep the energy smooth. Stepping out and sinking, only to rise when closing the step, creates movement that is closer to ballroom dancing, or a waltz, than what the Taiji standard should be. This is yet another all-too-common defect. Unless jumping up to kick, or dropping down to the ground to sweep, the level of the Dantian should remain undisturbed. Beginners, when applying An (Push), commonly lift their rear heel, and rise up on to the toes. This affects the Dantian’s stability, causing Qi to rise, and loses the vital connection to the ground, thus dissipating power, and preventing from Qi returning to the Dantian. Unique to the Chen Family style of Taijiquan (the original and oldest version) is Fajing or Releasing/ Issuing Power. The Chen Taiji punch is like a bullet that follows a straight path, but exits the grooved rifle barrel in a spiral fashion. Before power is discharged, energy is gathered and stored like drawing a bow before releasing the arrow. But, the storing energy is soft. You must relax every part of the body (especially shoulders, hips and Dantian), internal Qi must be full, and when you are settled, relaxed, and empty, energy is released explosively. This explosive power comes from the sudden and instantaneous transference of weight, combined with the whipping effect of the Dantian. “Energy is rooted in the feet, issued through the legs, administered by the waist, travels up the back, through the shoulders and manifested in the hands”, according to the Taiji classics. There should be a loose, lively, springy, shaking force, and a rippling through the body as the shoulders, chest and hips rotate in small circles, supported by the rotation of the Dantian. The shorter the Fajing time the more power that is generated. This is dependent upon no tension present within the muscles, and no blockages of Qi in the joints. Using too much force, in other words trying too hard to generate power only succeeds in creating tension, which obstructs the inner Qi flow, and prohibits the full penetrating potential of the strike. Hard and soft must alternate, and fast and slow must alternate. Beginning Taiji studies, breathing is not really discussed or emphasized at all. Those unfamiliar with the movements will not be doing the movement properly, or using force correctly, so it’s best not to be concerned too much with the breath, and trying to synchronize with the movement. It is preferable to just relax and let the body receive the air it needs naturally. Later, with more experience, as the movement becomes clearer, then the breathing will adjust to the right way, which is to inhale and return Qi to Dantian as you draw energy in and prepare for attack, and exhale as you release Jin. Practicing Zhan Zhuang, as foundation training, before learning the form, is vital as deep natural abdominal breathing can be fostered and instilled, without the overwhelming mass of information that follows and having to coordinate upper body and lower body, and left side with right etc. So, by the time you come to learn the form, and correct movement principles, you are already breathing the right way and applying the right energy, without needing to relearn how to breathe properly. Mind and the breath have a profoundly symbiotic relationship. According to Chinese medical principles, “Yi (Mind) leads Qi”. Internal energy is affected and directed by the mind, just as three deep breaths can exert a calming effect on an angry or anxious mind. If the breathing is not smooth and even, Qi can be chaotic, because Mind is over-stimulated and distracted, then external movement cannot be smooth, and flow correctly. Once mind intent, attention, and concentration is lost, and disconnected from the physical body movement, Qi becomes scattered and power diffused. The final aspect of energy concerns Spirit, and attitude. This bare-handed (and armed) combat boxing was created by a military general and master martial artist (Chen Wangting). It was passed down to generations of Chen family bodyguards and armed escorts. The classics state that the form should be “like a falcon about to seize a rabbit”, and the spirit is “like that of a cat about to catch a rat”. Today, much Taiji we see is performed in some kind of somnambulistic state. Practitioners stare blankly into the void, or eyes are almost closed, in imagined states of nirvana, completely unaware of their surroundings (and not truly aware of the internal either). Is this really the spirit/ energy and attitude of Taijiquan practiced and envisioned by General Chen and his descendants? When you witness an exponent performing Taijiquan (or any skill) you are not looking at “The” form, but “His” (or “Her”) form – his interpretation and execution of it, which is unique. It is a culmination of his spirit and energy; his essence; the accumulation of his training and experience. Experience includes the energy of his teacher and forbears. His form should not be unrecognizable from generations past. Most students will manage to copy their teacher’s external physical movements, to varying degrees of accuracy, while only a few will succeed in replicating his energy. This is harder to grasp due to the subtlety, and requires a special sensitivity to “see”, like a deep appreciation of art. A master’s energy encompasses the trinity of physical movement (body), intention/ attitude (mind), and Qi (Spirit). Three become One, not separate. A master’s form should change and improve, quite noticeably decade to decade. This is because the energy becomes clearer and more refined, as the skill reveals itself more and more, in successive layers, like peeling an onion. However, for a great many practitioners, their form does not change one iota, and remains exactly the same year-in year-out. This situation cannot be right as Taiji itself represents change. In the beginning it is natural to make many mistakes. No-one will come close to perfect for many years, but that is not important. It is all part of the process – the learning journey. Taijiquan is very humbling. What is important is to work hard to reduce our mistakes/ defects, so that we steadily close the distance every day between where we are currently and what the principles and standard of Taijiquan should be. There are two types of incorrect Taiji practice. The first is the result of students that have been taught properly, and know the correct principles, but have not yet been able to apply them and execute the forms properly. The second kind is due to those that think they understand, but, in reality, do not. It could be that they were never taught properly, or were taught properly, but failed to pay adequate attention and give sufficient care, before leaving their teachers. Those within the first category may eventually come to attain correct Taiji, with plenty of practice and remaining focused on what they’ve learned, as they know what they need to be doing. However, those within the second category are incapable of ever really developing good skill because they never consider having faults to correct in the first place. They tend to carry their mistakes with them for the rest of their lives. Learning the form really is the easy part of the process. Almost anyone is capable of this. And, completing a form, despite the sense of accomplishment, is actually nothing special, as it is just the sequence. While the movements remain external, without the right internal energy, the form is considered “Empty” or “Hollow”. At this stage, an acceptable standard of Taijiquan has not yet been reached, yet many practitioners remain quite content at this level, and never seem to get beyond it. Checking that correct posture is maintained, ensuring the correct movement principles are upheld, and using the right energy, is much harder as it demands constant care and vigilance, like tending to a garden, so that it does not become overrun with weeds. The weeds are our mistakes. This is how we come to attain correct Taijiquan.